Bolt soap carving. . HD Wallpaper and background images in the Disney's Bolt club. 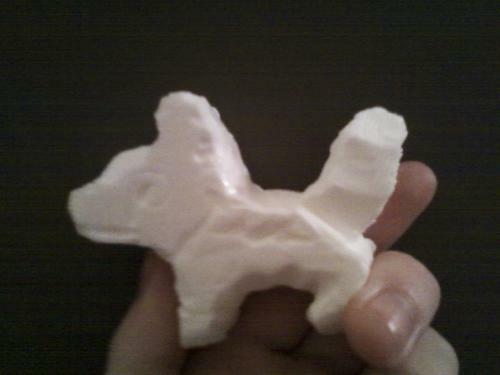 My class had to present our soap carvings, and so when I went up there, I said, "This is a dog. But this is no ordinary dog. This is a dog with super powers! THIS is BOLT THE SUPERDOG!" Then I started telling the story about how the first time I tried making him, his whole back end broke off, and how his front feet broke off the second one and I had to fix it. Then when I finished sharing, at the end, I realized I forgot to say why I chose to make Bolt. I raised my hand and said "I forgot to say why I made Bolt. I made him because I'm his biggest fan!" Cool! Better than I could make it! You've got talent! Nice work!